I was able to purchase Design Essentials products at the Toronto Natural Hair & Beauty Show and in true product junkie form couldn’t wait to try them. The deal was any 3 of their products for $24.99 – score! 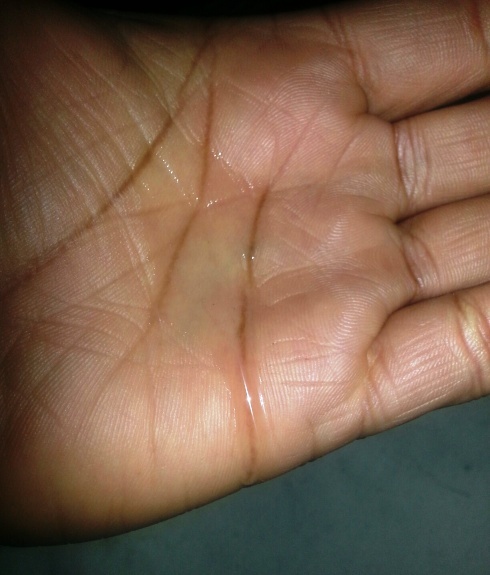 (I really was doing it for you guys…. Really). So here’s what I thought of DE when I used it! Jojoba Oil, Olive Oil, vitamins and proteins such as Panthenol and Silk Amino-Acids. Water, Olea Europaea (Olive) Fruit Oil, Glycerin, PVP/VA Copolymer, Simmondsia Chinensis (Jojoba) Seed Oil, Sodium Borate, Carbomer, Fragrance, Phenoxyethanol (and) Caprylyl Glycol (and) Potassium Sorbate (and) Hexylene Glycol, Hydrolyzed Wheat Protein, Cocos Nucifera (Coconut) Oil (and) Aloe Barbadensis Leaf Extract, Octinoxate, Oleth-5, Persea Gratissima (Avocado) Oil, Prunus Amygdalys Dulcis (Sweet Almond) Oil, Coconut Oil, Theobroma Cacao (Cocoa) Seed Butter, Butyrospermum Parkii (Shea Butter), EDTA Disodium, BHT, Caramel, Silk Amino Acid, Wheat Amino Acids, Sodium Hyaluronate. I didn’t notice in all my excitement that this product contains petrolatum, so now I barely use it. It also contains: Isopropyl Myristate, Mineral Oil, Paraffin, Myristyl Myristate, PEG-40 Sorbitan Peroleate, Jojoba Oil, Squalene, Mink Oil, Tocopheryl (Vitamin E) Acetate, Apocynum Cannabinum Root Extract, Urtica Dioica (Nettle) Extract, Rosmarinus Officinalis (Rosemary) Leaf Extract, Arctium Lappa Root Extract, Betula Alba Bark Extract, Rosa Canina Fruit Extract, Chondrus Crispus (Carrageenan) Extract, Tussilago Farfara (Coltsfoot) Leaf Extract, Taraxacum Officinale (Dandelion) Extract, Rumex Crispus Root Extract, Sambucus Nigra Flower Extract, Equisetum Hyemale Extract, Prunus Serotina (Wild Cherry) Bark Extract, Echnacea Purpurea Extract, Panax Ginseng Root Extract, Fragrance, Propylparaben, BHT, Benzoic Acid. 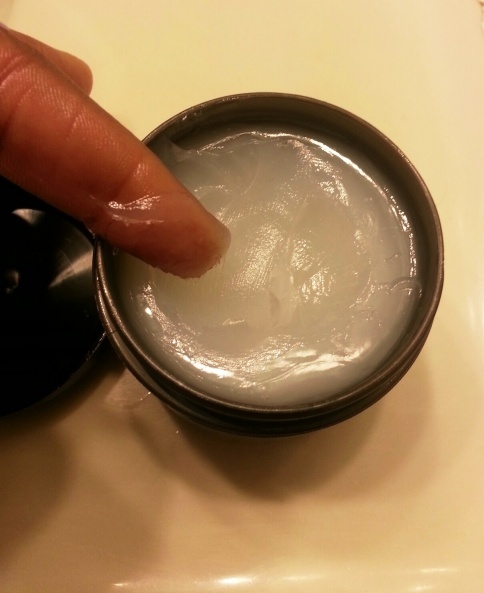 It is said to condition, moisturize, add shine and provide medium hold. 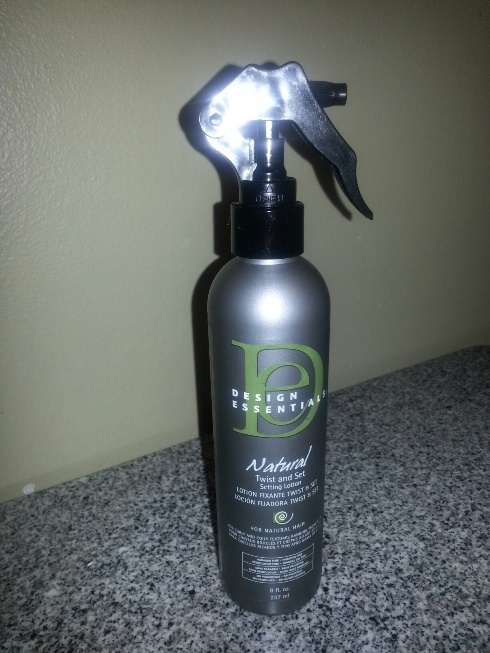 It is also to help with detangling and styling versatility for natural hair. It has the consistency of water with a slight stickiness. It is supposed to define curls and ideal for wavy to tightly curled hair types. It is like a creamy gel, almost whipped consistency so actually quite light. 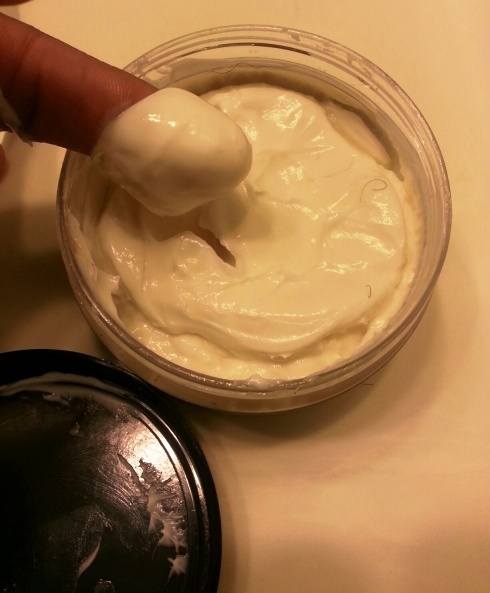 It is supposed to alleviate dry scalp and moisturize hair. It has the same texture as any other hair grease, though not as sticky or heavy. Natural Twist & Set Setting Lotion: there’s a drink back home called Peardrax (pear-flavoured beverage) and this stuff smells JUST like it. I love using it for that reason if no other! 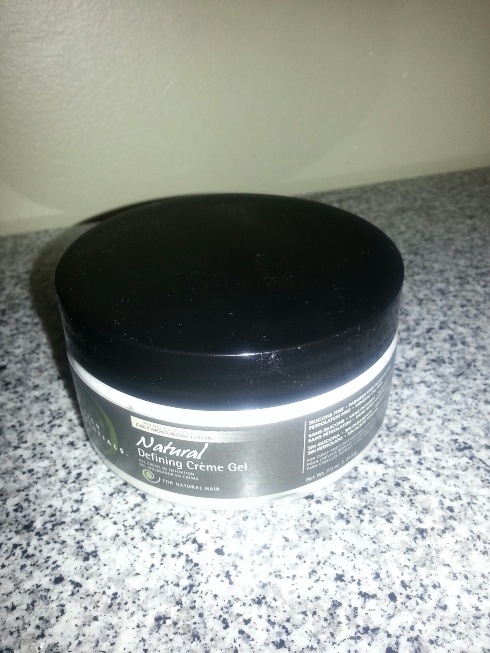 Natural Defining Creme Gel: there isn’t a very strong or distinct smell, but it reminds me of whipped cream. Yum. 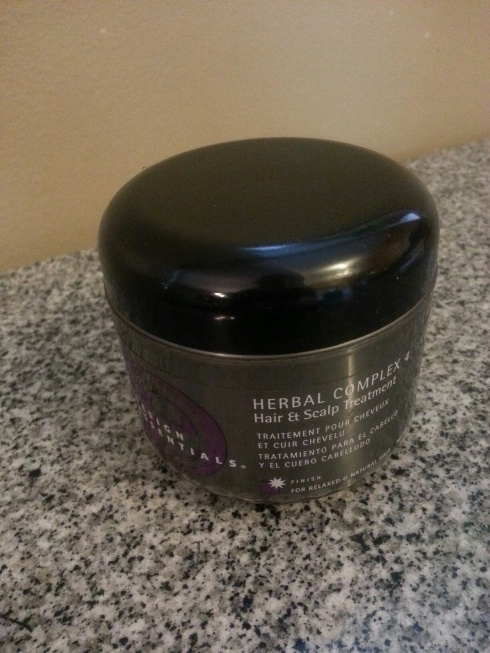 Herbal Complex 4 Hair & Scalp Treatment: it also doesn’t have a very strong smell, it just smells nice and light. I co-washed and deep conditioned as usual sat under my Huetiful, then sprayed with the Twist & Set Setting Lotion followed by Earthtones Hair Butter for added moisture. 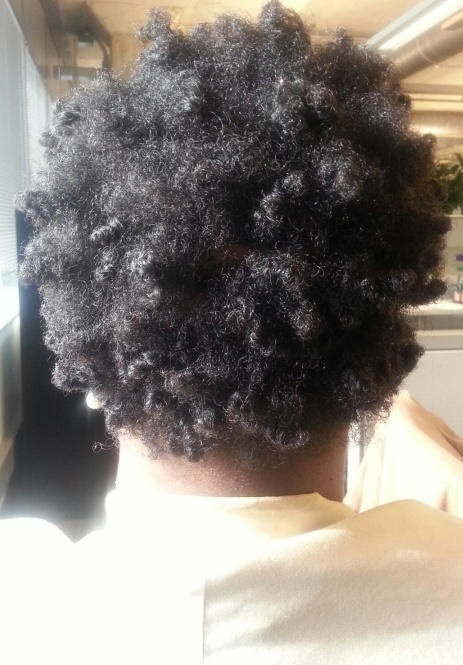 I then applied a small amount of the Defining creme gel to each small section then two-strand twisted and bantu-knotted. Since I’d just washed my hair, I also applied a bit of the Hair&Scalp treatment to the problem flakey area (the back of my head). The end result gives good curl definition, with great hold and shine that lasted. BUT with a few more uses, I find that the Twist and Set lotion left my hair feeling dry and flakey so I have stopped using it. 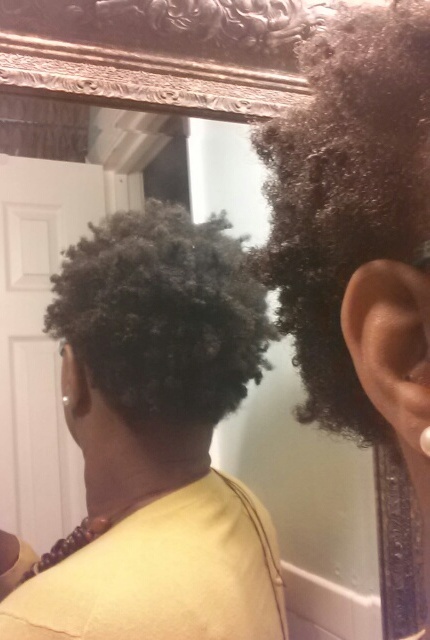 I do still like the defining creme gel and am really pleased with how my twist-out turn out when I use it. And 2nd day twist-out is a thing I long for and struggle to get. I was able to somewhat achieve it with these products. I don’t regret buying and trying these products, as it is all part of the process. 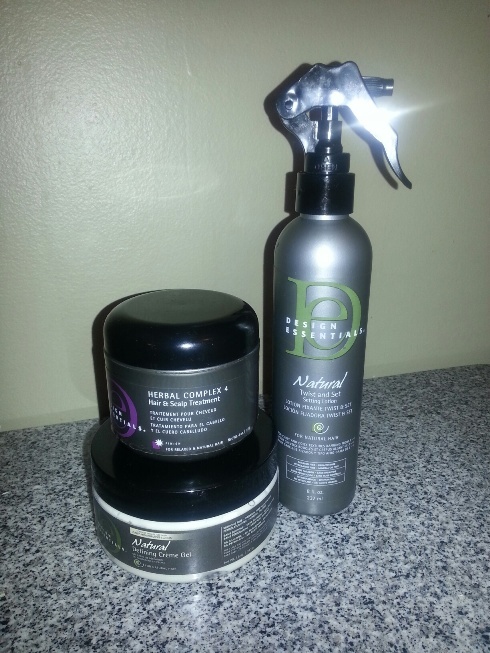 They are not necessarily my go-to products for styling, but I like using the scalp treatment. These products are available on Design Essentials website for: Natural Twist & Set Setting Lotion (8oz) $13.99, Natural Defining Creme Gel (16oz) $27.99 – I purchased the 7.5oz and that’s a fairly decent size, Herbal Complex 4 (4oz) $10.99. There are an array of products depending on your hair type and needs (for wet and dry styling). Depending on where you live, some retailers may carry it but I was happy to get them at the Hair show! If you’ve used any of these products, I’d like to hear which ones and what you thought! Leave your comments below! Thanks Seph! And You totally MUST smell it!